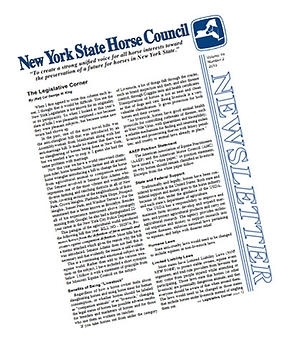 The New York State Horse Council Newsletter is a great way to get the word out about equine activities and initiatives. To make it successful and useful to all, the Newsletter Editor needs your input and is excited to share articles and pictures from all of our members. If you have questions, please phone: 716-735-3529. - Issue 1 - January, February and March. - Issue 2 - Deadline is February 15th. - Issue 3 - Deadline is May 15th. - Issue 4 - Deadline isAugust 15th. As well as being e-mailed or sent via postal mail to all members, each newsletter is also posted above.